With combined experience, a 100% satisfaction guarantee, certified Glendale roofing technicians, on-call service and good standing with the Better Business Bureau, you can feel confident that any roofing work necessary will be completed on-time and with excellence. Our goal is to exceed your expectations and we uphold our promise to help determine exactly what you need. Our Glendale roofing company will gladly work with designers, builders and other professionals to get the job done. Check our extensive gallery of before and after roofing photos, or read our extensive collection of testimonials to gain a first-hand picture of the capabilities our skilled contractors and technicians have. When you read through the rave reviews provided by people who have already trusted our company with their Glendale roofing needs, you’ll feel confident with your choice to hire us today. 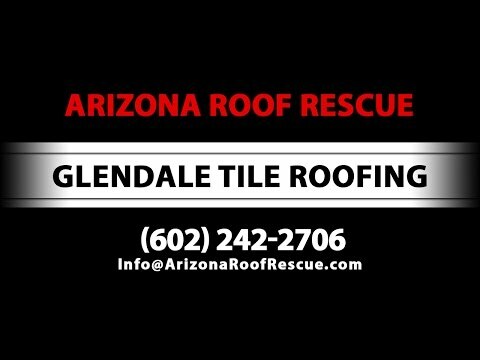 With our years of experience comes the professional knowledge needed to allow Arizona Roof Rescue to be one of Glendale’s leading roofing contractor companies. As a roofing contractor, we feel we must give uncompromising quality along with the great value we provide to each of our Arizona residential and commercial roofing clients. We will promptly give free estimates and help you find the product that best fits the needs of your homes, your personal style, and your home’s architectural needs. A lot more beautiful choices are available from a versatile roofing contractor using from several different roofing material manufacturers. Our experienced roofing contractors specialize in all aspects of affordable residential roofing services as well as professional commercial roofing services. We have extensive experience with new tile roof installations, shingle roofs, metal roofs, rolled roofing, and flat roofs. We can complete any type of roofing system on any home or business, neatly, safely, and quickly. If your Glendale home is in need of quality roof maintenance, repairs, a completely new roof, or even leak repairs, contact the expert roofing contractors at Arizona Roof Rescue today, and receive your free roofing quote from a trusted Phoenix Valley roofing professional.